To advocate for the protection of maritime cultural resources, which includes prehistoric and historic resources in California’s lakes, rivers, reservoirs, and coastal areas through the continued developments in maritime archaeological method and theory; to provide a space for the exchange of ideas and collaboration between schools, government agencies, industry, and any other interested individual or party; to promote public outreach and awareness of maritime archaeology; to develop professional standards and guidelines for survey, testing, and research to hold maritime archaeological projects to the same standards as terrestrial archaeology; and to coordinate efforts that occur across California with the goal of sharing resources and expertise among colleagues. CA Maritime Heritage News focuses on providing information on the various maritime projects happening around the state in an effort to draw attention toward key maritime issues that can shape the future of research and management. 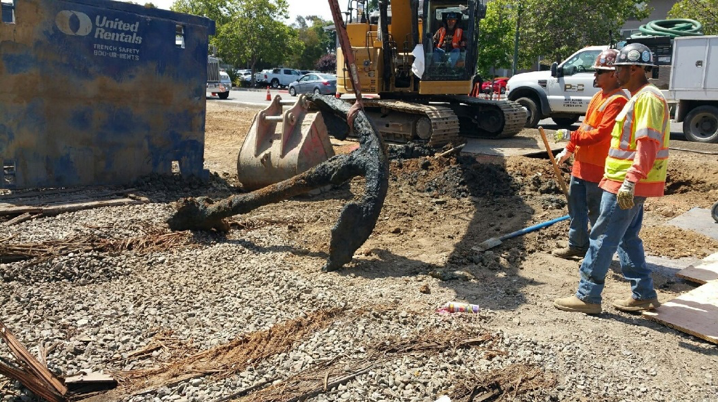 A construction crew working along a PG&E gas replacement project in Oakland discovered an anchor earlier this summer. The crew was excavating a trench along Embarcadero & 16th Avenue when the anchor was uncovered. Initially, it was believed that they had encountered a buried utility line, since only the midsection of the anchor was visible. However, upon removal the crew was surprised to find an anchor. Per PG&E’s policy the crew stopped work until an archaeologist could assess the discovery. Stantec had been monitoring this project and began researching the location, and determined that the anchor had been part of a floating pontoon wharf during the turn of the century, when the area was a tidal marsh. The anchor and associated wharf fragments were recorded by Stantec’s archaeological site monitor, Leven Kraushaar. 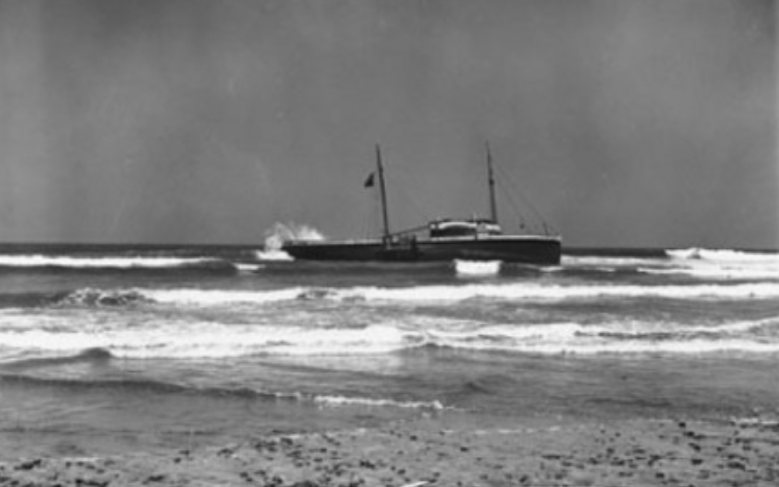 The Glenn Mayne, a tuna clipper turned recreational fishing barge, ran aground on a beach near Oceanside on July 14, 1939 after her anchor chain snapped. Before becoming a barge, the Glenn Mayne served many years as a commercial fishing boat in the Pacific Ocean between California/Hawaii and along the California Coast. It broke up along the beach and much of the ship was covered by sand. In February, locals noticed that a large portion of the Glenn Mayne was uncovered and the shipwreck was featured on the cover of a local magazine, bringing it to the attention of California State Parks. On Saturday, August 4, a team of archaeologists and divers from Parks’ Maritime Heritage Program visited and began documentation of the exposed portion of the shipwreck. Noted remains include several wooden futtocks, planking, and a machinery wheel. Because the site lies in the surf line of a shifting sandy beach, this winter was the first time the ship was exposed in several years. A DPR 523 site record will be submitted to the South Coastal Information Center to facilitate future identification/documentation efforts. Image courtesy of San Diego Historical Society. For more information, contact Denise.Jaffke@nullparks.ca.gov. Pomona was built by the Union Iron Works at their Potrero Point facility on San Francisco Bay and launched in the summer of 1888. The steamship’s career spanned twenty years, a time of remarkable changes in the Pacific coastal trade economy. On March 8, 1908, S.S. Pomona struck a submerged pinnacle off Monterey Reef while en route from San Francisco to Eureka 12 miles north of Jenner, Sonoma County. Pomona became a serious navigational hazard to the smaller lumber schooners entering the Fort Ross Cove so explosives were used to further break apart and flatten what remained of the vessel. As part of the Sonoma Coast Doghole Ports project (https://farallones.noaa.gov/heritage/doghole_fortross.html), the NOAA/California State Parks team wanted to test the application of computer-vision photogrammetry as a tool for comprehensive monitoring of the site. Divers swam transects over a portion of the site while taking top-down photos at 2-second intervals with a GoPro Hero 4 camera. The images were processed to correct-color, adjust white balance, and edit for clarity, sharpness, and feature definition. Edited images were then imported into the structure-from-motion photogrammetry software Agisoft Photoscan for image alignment and creation of 3D model and orthomosaic. The test proved incredibly successful and will permit routine rapid assessment in the future. We hope to return in summer 2018 to map the entire site. Off the Pacific Coast of North America, rising postglacial sea levels have submerged a vast paleolandscape that almost certainly contains inundated terrestrial archaeological resources. It is likely that many of these areas are also associated now with important marine biological features. Few submerged sites have been identified and little ground-truthing has been done. 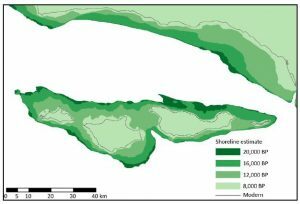 Reconstruction of shorelines of the Northern Channel Islands through time. The Bureau of Ocean Energy Management (BOEM), in partnership with San Diego State University, as well as other academic and federal partners, is conducting a submerged landform study extending from southern California to central Oregon. This study will synthesize specific geological and geophysical data from offshore southern California and central Oregon, conduct field investigations, refine local sea-level models, and determine if these features are associated with ecologically sensitive areas (https://www.boem.gov/PC-14-04-Fact-Sheet/). The research group will survey and sample target areas based on archaeological and biological indicators. For more information, contact tbraje@nullmail.sdsu.edu, david.ball@nullboem.gov, agusick@nullnhm.org. 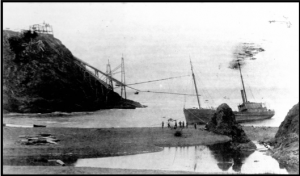 The lumber steamer Maggie Ross wrecked on Russian Gulch Beach in 1892. Note the two slide chutes in the background. Photo courtesy of Sonoma County Library. On June 7, 2017, a diver from the U.C. Davis Bodega Marine Laboratory found the bow section of a steam schooner that wrecked off the coast of Russian Gulch in August, 1892. The schooner, subsequently identified as Maggie Ross, was headed north from San Francisco when it struck a submerged rock near the former Russian outpost of Fort Ross. The vessel was built in 1878 at Pleasant Point, Oregon and measured 115 ft long by 32 feet wide with a 10-foot deep hold. The captain was able to beach the foundering vessel at the nearest “doghole” port, Russian Gulch, two miles north of the mouth of the Russian River. The steam wrecker, Whitelaw, was dispatched the following day in an attempt to retrieve the ship. Soon after arrival, Whitelaw realized that the steamer could not be saved and salvage operations began on the engine and cargo. Archaeologists from California State Parks and NOAA recorded the exposed vessel remains and conducted an intensive metal detector survey to locate additional elements in August 2017, but none were found.